Back in November 2008, we covered the launch of Twilio, a startup that’s akin to an Amazon Web Services for telephony apps. After signing up for a phone number, Twilio lets you integrate phone services into your application using intuitive tags like Dial when you want your app to place a call. Today, the company is expanding to include support for the world’s most popular data channel: SMS messaging. The basic idea remains the same. As with its telephony API, Twilio’s SMS functionality is meant to make previously complex tasks as simple as possible. If you want to send a SMS message to a user from your web app, you can do that using a single line of code. CEO Jeff Lawson says that this new functionality removes many of the hurdles associated with running a service that uses SMS. He explains that it’s often very expensive and time consuming to get your own SMS shortcode, and that the logistical hurdles are substantial. 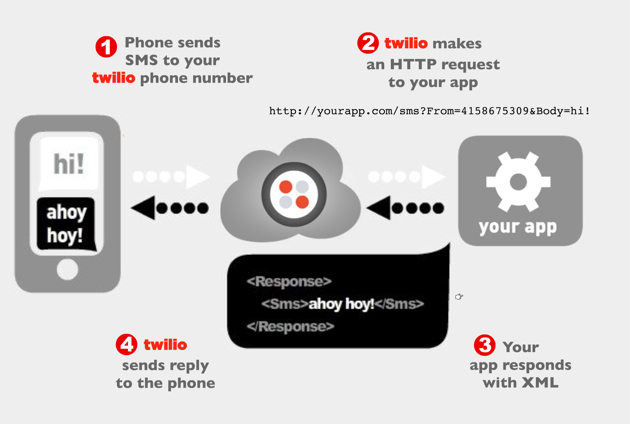 With Twilio, you can get SMS up and running on your web app in a few minutes. Potential uses for the service are really limited only by developers’ imaginations. For example, a developer over at the Washington State Department of Transportation used Twilio’s phone API to build a call-in service that lets local residents call a number to listen to the schedule of the local ferry. Using this new SMS functionality, that developer could allow users to simply text a query like “When is the next ferry?”, to which the application could automatically send a reply. Businesses could use the service to occasionally ping their customers with new deals and discounts. Politicians could use the service for their awareness campaigns (they already make heavy use of Twilio’s telephone offerings). And Salesforce recently used a beta version of the service to build a custom audience polling app for its Dreamforce conference. One key aspect of the new service is that it lets you use the same phone number for Twilio’s phone services and SMS messages (it also means that you can use SMS with any existing Twilio numbers you may have). The service costs 3 cents per text message, and Twilio’s voice service costs 3 cents per minute during a call. Twilio isn’t the only company around that looks to make it easier to leverage SMS. Many of its competitors, like TextMarks, use a shared shortcode model — they own the rights to one shortcode, and then have all of their clients share it. Each client is given a keyword, which users are then instructed to include in their messages. For example, if we wanted to build an SMS app using one of these services, we might tell our users to “Text 41441 with keyword TECHCRUNCH”. Twilio has an advantage over these services because users don’t have to remember to include a keyword; they simply send their query to a standard phone number. Other options include more enterprise-focused shortcode aggregators, and Tropo, which is run by Voxeo. There’s a broad appeal for SMS-based services — it’s just the hassle of setting one up (or the impression that it would be expensive) that keeps many businesses from doing it. Which is why I think Twilio seems positioned to do quite well with this new feature. That said, I think Twilio could appeal to a much broader set of users if they built some kind of wizard for its API. No matter how simple Twilio’s API is to use, most small businesses and retailers probably don’t have any developer resources to speak of. And given the fact that most of them will probably be interested in sharing the same information via SMS — things like directions, their hours, and sales — it probably wouldn’t be hard to fill most of their needs using a few template programs. Twilio has raised $3.7 million in funding, including a Series A round from Union Square Ventures and angel funding from Founders Fund, David Cohen, Mitch Kapor, Manu Kumar, Chris Sacca, and other angels.